So then second thing was, I had to decide what to make. My first creation was a Cookies and PB Chocolate Ice Cream Parfait, which I made about a month ago. You know you can’t go wrong with Chocolate and Peanut Butter I always say. And now the next best combination Nutella and Peanut Butter, trust me it’s a good one. All you have to do is taste this No-Churn Ice Cream and you will understand. Just ask my youngest daughter who is a I-love-Nutella-but-you-can-have-the-Peanut-Butter-kind-of-girl, decided that Peanut Butter Chips were really not too bad and that this Easy No-Churn Ice Cream was amazing. 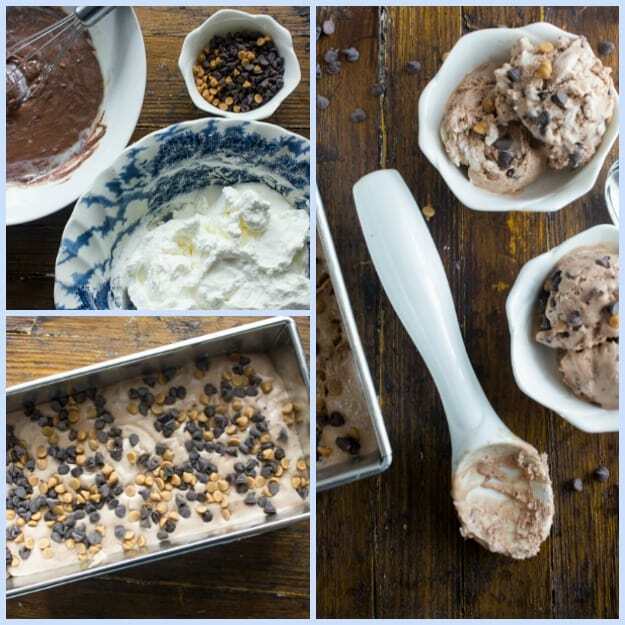 Once you start getting into the habit of making your own Ice Cream or Gelato with or without a machine, believe me you will be making your own this summer and wondering how you ever ate store-bought. 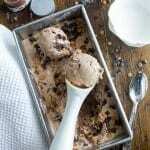 This Ice Cream recipe is so fast and simple the kids will love giving you a hand making it and not just eating it. 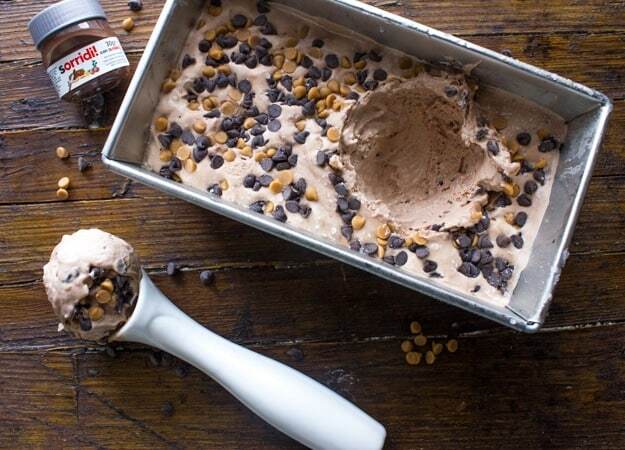 So get out those extra mini Peanut Butter Chips and start making some Ice Cream. Enjoy! 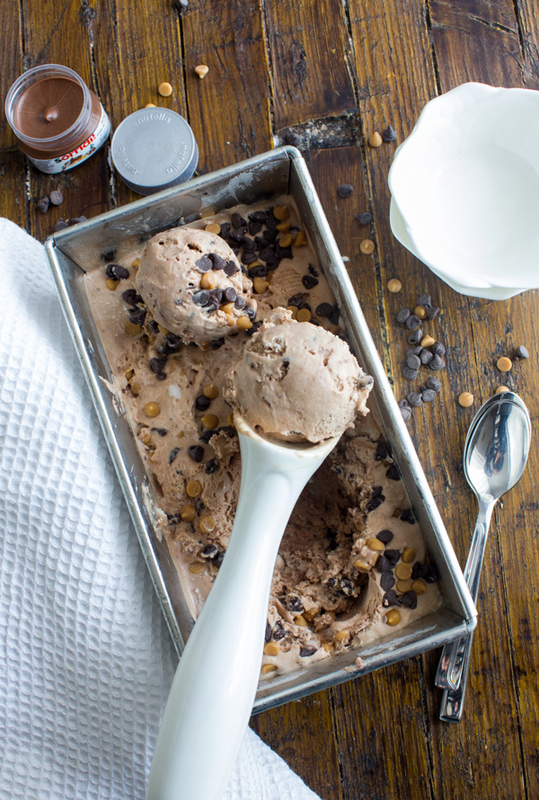 Homemade Nutella Peanut Butter Chip is an Easy No-Churn Ice Cream, a fast and easy Ice Cream Recipe. A delicious summer dessert. Thin out the Nutella a little, either by placing in a bowl over a pot of boiling water or microwave. In a small bowl whisk together Nutella and sweetened condensed milk. Stir to combine. In a cold bowl with cold beaters (I place mine in the freezer for about 15-20 minutes).Whip cream until stiff (be careful not to make butter). Add a little whipped cream to the Nutella/sweetened condensed milk mixture to make it easier to combine, then fold in the rest of the whipped cream mixture, and then gently fold in Peanut Butter chips. Place into a loaf pan 8x4 inch (20x10 centimeters). Then either cover in plastic or place loaf pan in a large ziplock bag and freeze at least 3- 5 hours until frozen or even overnight. Enjoy! Thanks Laura, I agree, they taste great together. Have a great day. could I could regular peanut butter instead of the chips??? Hi Stephanie, I don’t see why not, try the same amount as the Nutella, let me know how it turns out. Hello, I was wondering if I could use chocolate flavored sweetened condensed milk, because that’s what I have on hand. Would it be too sweet if I used chocolate sweetened condensed instead of regular? Hi Jessica, hmmm another thing I can’t get here. Sounds interesting though, check the ingredients and see if there is a big difference in sugar content, if not sure why not give it a try. Then let me know. Have a great weekend. Hi Mary, thanks and I hope you do make some and then let me know what you think! Happy Sunday. No churn ice cream is the best. Love this flavor combo too! Thanks Allison and I totally agree. When you mention “whole cream” in this recipe is it heavy whipping cream? Hi Kristine, yes, either heavy cream or whipping cream, in Italy you an only purchase heavy cream. Thanks. Hi Winnie, thanks and yes it is! Have a great weekend. We all should have a Canadian chocolate stash 🙂 This is incredible–all the falvors I absolutely love! Thanks Kristen, hope you enjoy it.